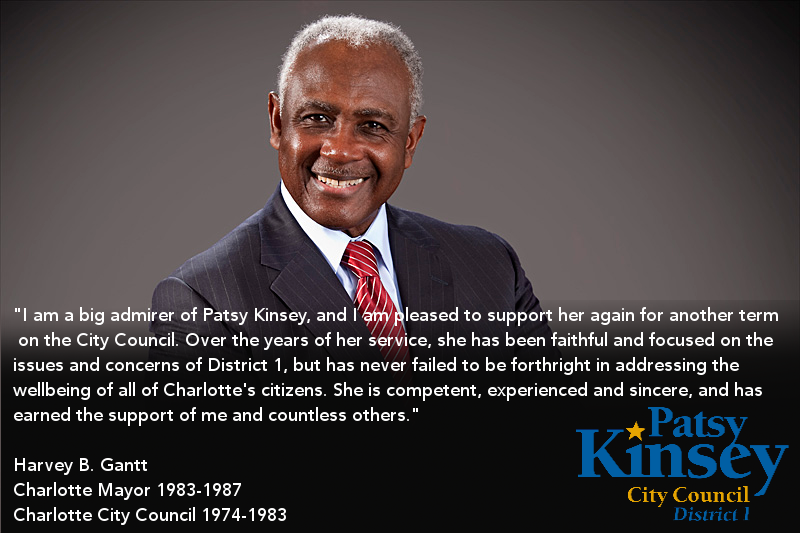 I am delighted to have received the endorsement of Harvey Gantt, Mayor of Charlotte from 1983 to 1987. He served on City Council from 1974 to 1983 and knows what it takes to do this job and do it well. We often talk about Mayor Gantt's political contributions to Charlotte, but he is also an award winning architect and he broke barriers as the first African-American student admitted to Clemson University. Most importantly, Harvey Gantt cares deeply about Charlotte and those who live in this great city. I am humbled and honored to have his endorsement. "I am a big admirer of Patsy Kinsey, and I am pleased to support her again for another term on the City Council. Over the years of her service, she has been faithful and focused on the issues and concerns of District 1, but has never failed to be forthright in addressing the well being of all of Charlotte's citizens. She is competent, experienced, and sincere, and has earned the support of me and countless others."